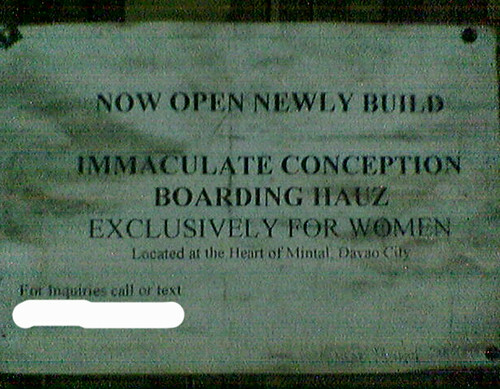 ate dinner with Mau, who is leaving for Melbourne, at Gisagis a few hours ago when we came across this sign. our place is called Mintal. there are many schools in this area, three universities in fact – university of mindanao, university of southeastern philippines and university of the philippines in mindanao. and with this current scenario, it is expected that this place, our mintal, offers many services for students. and this is one of it. and for my 7 year stay in this place, i still don’t know where the heart of mintal is. perhaps i’ll look for the intestines first. and what address will you use? Person 1: hey, where do you live? Person 2: at the heart of mintal. now where could that be?